One person is dead and 250,000 lost power after Hurricane Hermine made landfall in Florida’s Big Bend early Friday morning, and a Tropical Storm Watch was issued for New York City and parts of New Jersey and Connecticut. On Friday afternoon, the Tropical Storm Watches were upgraded to Tropical Storm Warnings in two New Jersey counties. Warnings were issued for Monmouth and Ocean counties, where tropical storm conditions are expected within 36 hours. "I don't want anyone to take this one lightly," New York City Mayor Bill de Blasio said at a hastily called news conference Friday morning. "There are some elements of this storm that are very, very troubling." 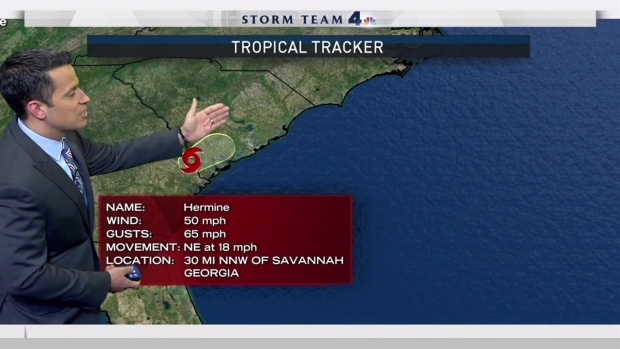 Hermine made landfall in Florida’s Big Bend early Friday morning as the first hurricane to hit the state in more than a decade, and a Tropical Storm Watch was issued for New York City and parts of New Jersey and Connecticut. He said city beaches would definitely be closed for swimming on Sunday, and possibly on Monday and Tuesday as well. The city is also considering bridge restrictions. 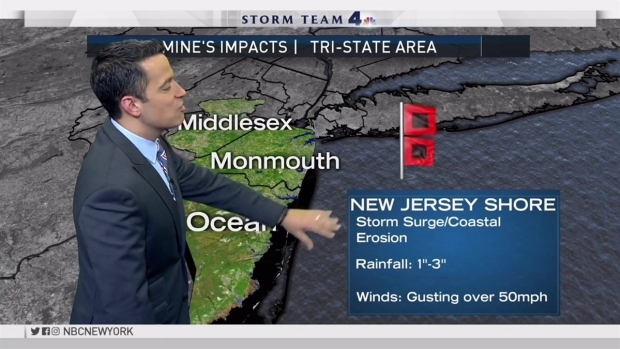 The National Weather Service issued a prototype storm surge watch covering the entire New Jersey coastline, New York City, parts of both shores of Long Island and extreme southwest Connecticut. Storm surge at some parts of the Jersey shore could be historic. "This storm could be very dangerous, particularly to people in coastal communities," de Blasio said. The storm hit as a Category 1 storm just east of St. Marks, Florida, around 1:30 a.m. Friday with winds around 80 mph, according to the U.S. National Hurricane Center. The storm was downgraded to a tropical storm just before 5 a.m., though it is expected to regain hurricane status by Monday morning. The latest models still take the storm offshore, but it looks like the system may stall out for 48 to 72 hours, leading to a multiday stretch that could include heavy rain, strong winds and coastal flooding for parts of New York City, Long Island and the Jersey Shore through Tuesday, Storm Team 4 said. "I's unusual for a storm to have a real direct impact for such a long period and that's what is causing us some real concern," de Blasio said. Raphael Miranda's midday forecast for Friday, September 2, 2016. Although Friday is expected to be calm and beautiful in the tri-state, the weather will take a turn for the worse on Saturday night. Clouds and winds will move in overnight Saturday into Sunday morning and the worst of the weather will hit during the day on Sunday. The New York City Department of Buildings is advising property owners, contractors and crane operators to secure buildings and equipment. All cranes will be ordered to stop operations on Saturday afternoon. But the sheer scope of the storm means that the wicked weather, especially rain, could last well into Labor Day on Monday. The storm is wide enough that its outer bands extended up to the Carolinas as it made landfall in Florida. In the tri-state, the Jersey Shore could get hit the hardest. Storm surges and coastal erosion are a serious concern on Sunday and Monday, and maybe even on Saturday as the storm moves in. Rainfall along the coast could top 6 inches and gusts may reach more than 40 mph. A major storm off the tri-state's coasts would likely exacerbate strong rip currents that have been observed at beaches across the region in recent days. This is especially true along the Jersey Shore. On Wednesday, lifeguards at Long Island beaches had to rescue two women and one boy from rip currents. 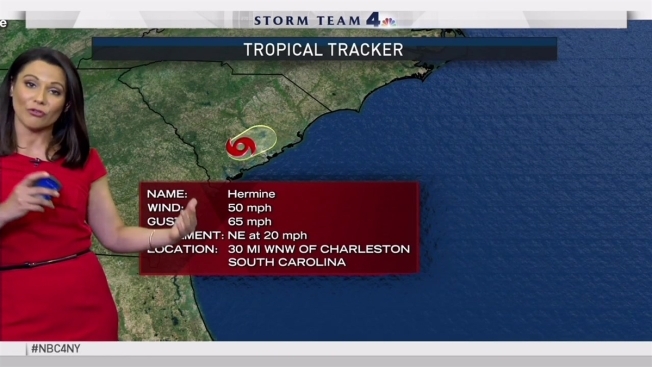 Hurricane Hermine touched down in Florida on Friday morning, bringing with it damaging winds and heavy rain. 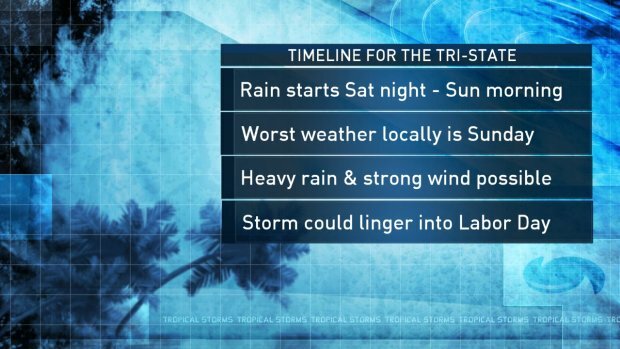 The storm was downgraded to a tropical storm, but it's long bands mean that the New York City area could see rain, wind and flooding much of Labor Day weekend. Jay Gray, Tracie Strahan and Katherine Creag report. Across the tri-state, residents braced for the possibility of heavy rains and strong winds. In parts of Long Island that are still recovering from Hurricane Sandy four years ago, residents are already preparing for the storm. In Lindenhurst, where some homes damaged by Sandy have yet to be rebuilt, residents tell NBC 4 New York they are already gathering extra food and water. It's a similar story on Staten Island, where empty plots of land where houses once stood before Sandy dot neighborhoods. Residents there told NBC 4 New York they are packing emergency bags with essentials like water, food and important documents like passports and insurance papers. On the Jersey Shore, resident took boats out of the ocean and public works crews pulled up plastic walkways at public access points. Grocery stores in New Jersey were also preparing for the storm, stocking large quantities of bottled water Friday night.